The Weimar Republic is the name for the parliamentary republic established in 1919, in Germany, to replace the former imperial form of government. Weimar is a city in the state of Thuringia, dating back to the beginning of the 10th Century. The Protestant Reformation was introduced in Weimar in 1525, and Martin Luther lived there on a number of occasions. The city was also the focal point of the German Enlightenment, during the 17th and 18th Centuries, and the home of some of the leading characters of Weimar Classicism, such as writers Johann Wolfgang von Goethe, Friedrich Schiller, the composer Franz Liszt, and artists / architects Henry van der Velde, Wassily Kandinsky, Paul Klee, Lyonel Feninger, and Walter Gropius. Weimar is also the city where the constitutional assembly took place after the end of World War I. The official name of the new republic was "Deutsches Reich", like that of the former German Empire. 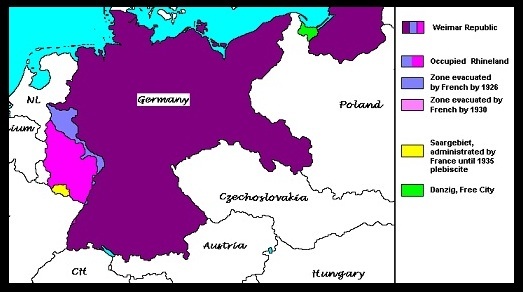 This is usually taken to mean "German Empire", but "Reich" can also mean "state" or "federal government". In English, the new country was just referred to as "Germany". During its 14 years, the new Republic was faced with huge problems, including rampant hyperinflation, political extremists, both on the left and the right, and their paramilitaries, and on-going hostility from the victors of World War I. The republic did, however, overcome many of the discriminatory provisions of the Treaty of Versailles, reform the currency, unify politics, and it re-built the railway system. One of the things they are greatly noted for is their advances in technology, especially in respect to commercial flight, with their great airships, capable of Worldwide passenger travel. The 1920's were a time of great economic prosperity in the republic. But, in late 1929, the worldwide Great Depression began. Unfortunately for the new republic, the lengthy worldwide depression would be its death-knell, and that would result in bringing the National Socialists to power in 1933. As of May 2018, the link pages in this Weimar Germany section have been completely reorganized, in order to allow the inclusion of ALL the stamps issued during the republic. Link pages called "General Issues" will contain only regular issue - definitive postage stamps. Link pages called "Commemorative Issues" will contain commemorative stamps and stamps that the Scott Catalog refers to as "semi-postal stamps". These are generally pictorial stamps surtaxed to raise money for charities or for patriotic events, and for the most part, they are commemorative in nature.